Easter cookie cakes are packed full with Easter candy! Whether you whip up this Easter Cookie Cake recipe before or after the holiday, I guarantee it won’t last long! This easy dessert is like a giant chocolate chip cookie on steroids. Perfect for any leftover Easter candy! When my children were in elementary school, I loved baking treats for them to take to school on their birthdays. Then one year, Nick, my youngest, asked if I could buy a grocery store cookie cake instead of something homemade. Harumph, I thought. But it was his day, so I honored his request. But I got to thinking that I could make a homemade cookie cake that would be sooooo much better. I just packed chocolate chip cookie dough into my deep dish pizza pan and decorated it with icing after it cooled. The whole family loved it. And I never got another request to buy a cookie cake. Now I make them for any occasion, and this Easter cookie cake is one of our favorites!! Cookie cake recipes are so versatile, you really can make them for any reason. For a Christmas party, it would be fun to serve this gingerbread cookie cake recipe, from Dorothy at Crazy for Crust. Celebrating a birthday? Cheryl from Tidy Mom has a recipe for a birthday sugar cookie cake! Fast forward to this year. 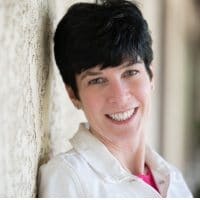 As a blogger, I “should” work ahead of the season. Like making a roasted turkey in October so I can share the recipe with you a few weeks before Thanksgiving. Usually, I forget or don’t bother. But seeing all the Easter candy on the store shelves, I grabbed a few bags and settled on baking up a cookie cake for the March book club meeting I was hosting at my house. If you’ve ever made chocolate chip cookies, this cookie cake will be a cinch to prepare. Like with baking cookies, there are a few simple tips for making a perfect cookie cake. Have your eggs at room temperature so they incorporate well. Whisk together your flour, baking soda and salt first so they’re well combined. 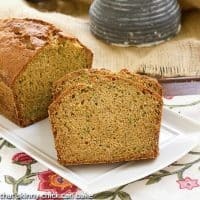 Have you ever eaten a baked good with a small piece of undissolved baking soda? Yuck, it doesn’t taste good. This step prevents that from happening. When it’s time to add the dry ingredients to the batter, use a wooden spoon to combine. That gives you a nice, dense and chewy cookie cake. If you must use a mixer, just mix on a very low speed until combined. You do not want to over activate the gluten or incorporate extra air into the dough. Press the dough into a greased pie plate and smooth the top. PRO-Tip: I like to reserve a few candies to press into the top when the cookie cake comes out of the oven for the best presentation. 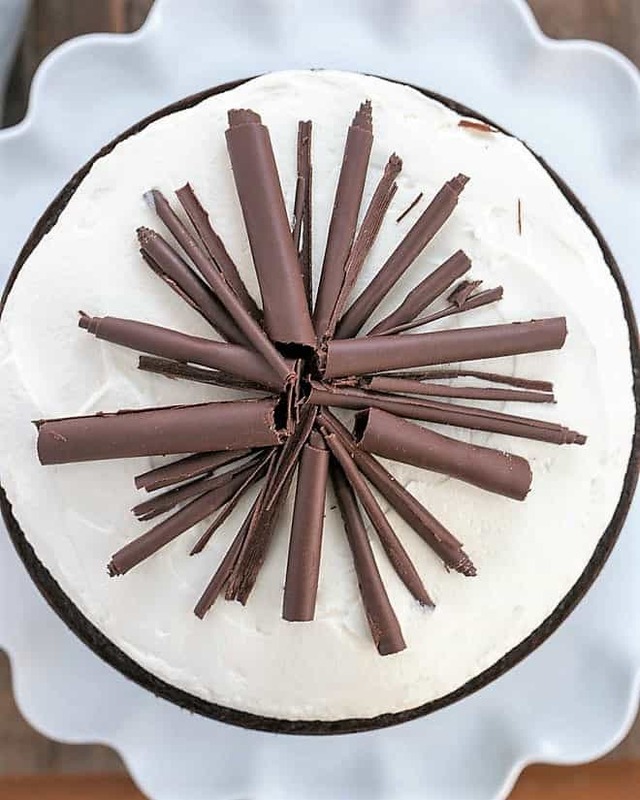 Bake until the top is browned and the cookie cake looks cooked in the center. A few minutes before the cookie cake is done, you’ll start smelling the wonderful aroma of baked chocolate chip cookies! You can also tap your finger in the center of the cookie cake. You should feel some resistance when it’s cooked. If your finger encounters dough, it’s not ready. I prefer my cookies and cookie cakes just a tad underdone, but if you prefer a more fully cooked cookie cake, add a couple minutes to the baking time. And remember that all ovens bake a little differently. The wedges of candy-laden cookie were a hit with my girlfriends. Needless to say, my chocoholic family loved these Easter cookie cake leftovers. My family also loves this White Chocolate Easter Bark and these Easter Cake Pops to celebrate the holiday! 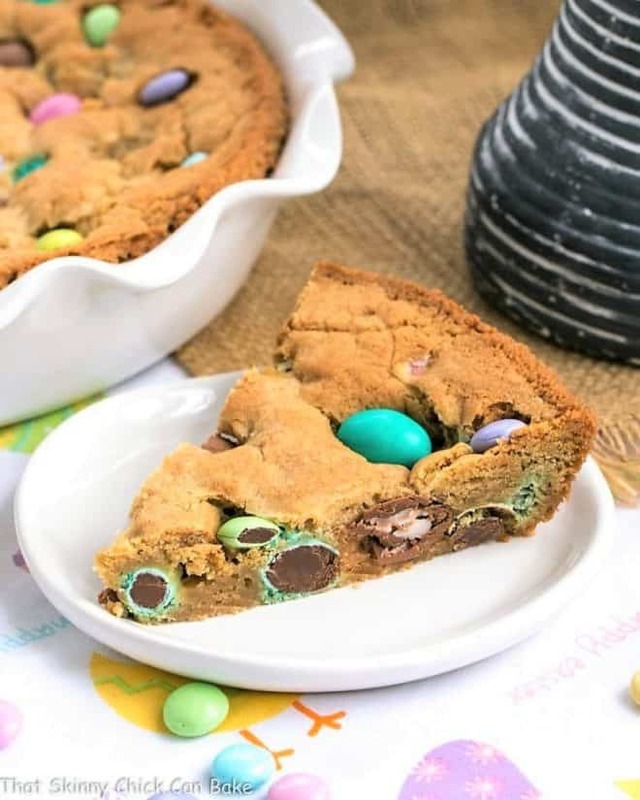 A giant candy-laden cookie baked up in a pie plate. Preheat oven to 350º. Spray a 9-inch pie plate with non-stick cooking spray. Set aside. Melt the butter in a large, microwave-safe bowl. Mix in the sugars, then the vanilla. Then stir in the egg. Whisk together the flour, baking soda and salt in a medium bowl. Then mix into the butter mixture just till combined. Add the chocolate chips and 1/2 cup of the candies. Reserve the remainder of the candy to garnish cookie cake when it comes out of the oven. Mix well. Scrape the dough into the prepared pan, then smooth the top with an offset spatula. Bake for 25 minutes or till top is golden brown. Remove from oven and gently press remaining candies across the surface of the cookie cake while it’s hot. That’s a great looking giant cookie! Hi Liz, putting this on our Easter menu, this will be a big hit, for the young and the old. Fantastic cookie cake, Liz. I could see it disappearing quickly at the Easter dessert table…or any table. Yum! This would not last at all in my house it would be eaten in minutes. What a lovely treat for Easter or any time of the year. So many treasures in here Liz! I can see why everyone loved this. I love how colorful and cheerful this is. I used to make giant cc cookie pizzas for the kids to take to school and this reminds me of that! But if I had those Easter eggs in my pantry they would never make it to the top of the cookie! Oh, my! 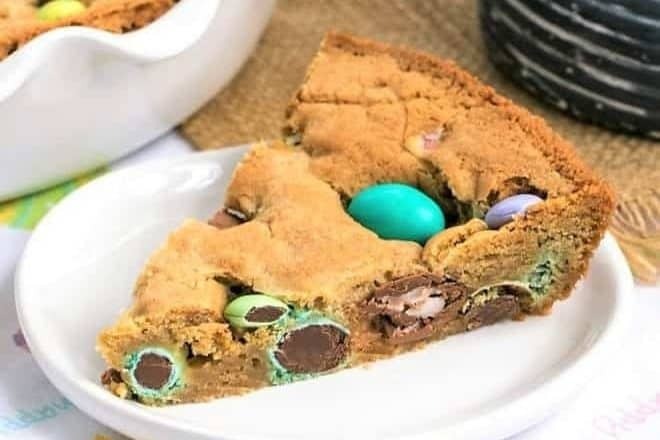 This is a treat to love and cherish… a cookie cake full of M&M’s and Cadbury eggs, a real fave of mine. Happy Easter!!!! 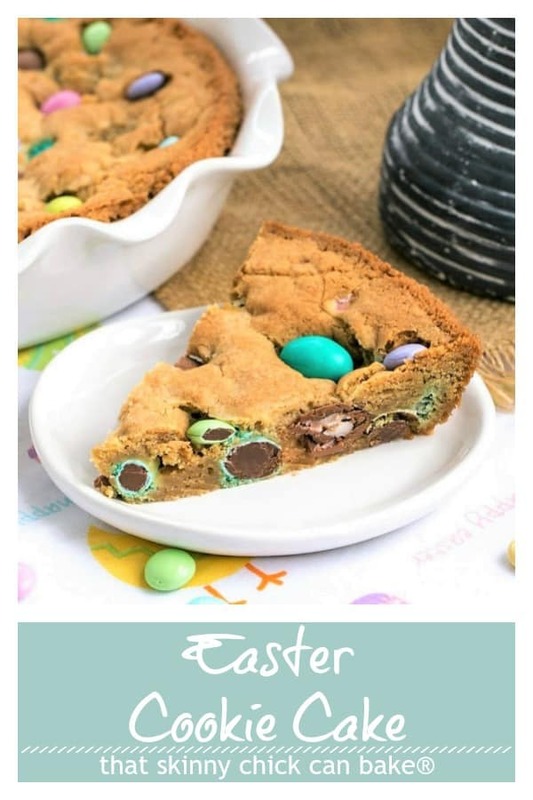 I love all that bright Easter candy packed into a giant cookie – pure perfection! Love this cookie cake! Pastel easter eggs are my all-time favourite eggs.. and I definitely have to try this out. Oh wow! This is such and adorable and fun idea. I love easter eggs and this one is perfect for Easter. Will give it a go! It’s a lovely story Liz ! My childrens as well ask for cookies who sells in supermarket but now they knows that homemade is always better! 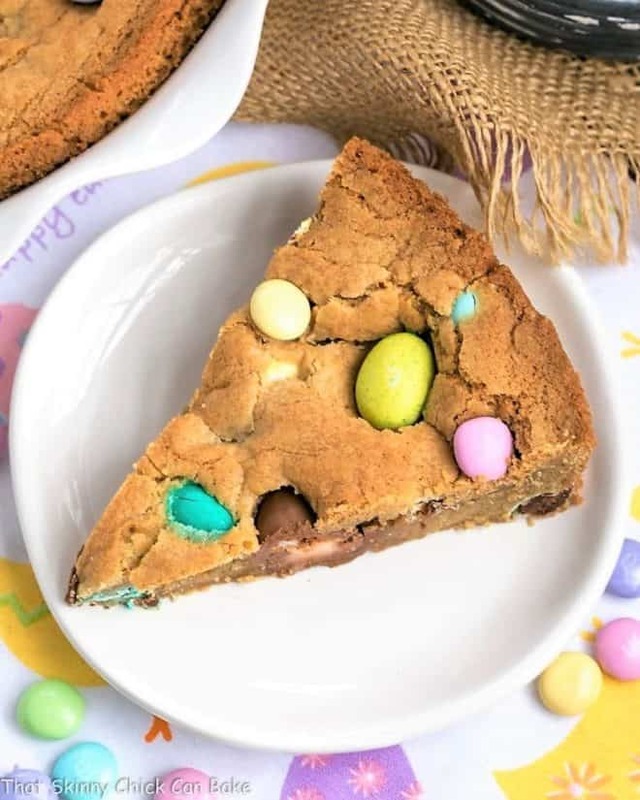 Your cookie cake looks terrific and I think is a great idea for easter ! You just made me realize that Easter is coming soon. 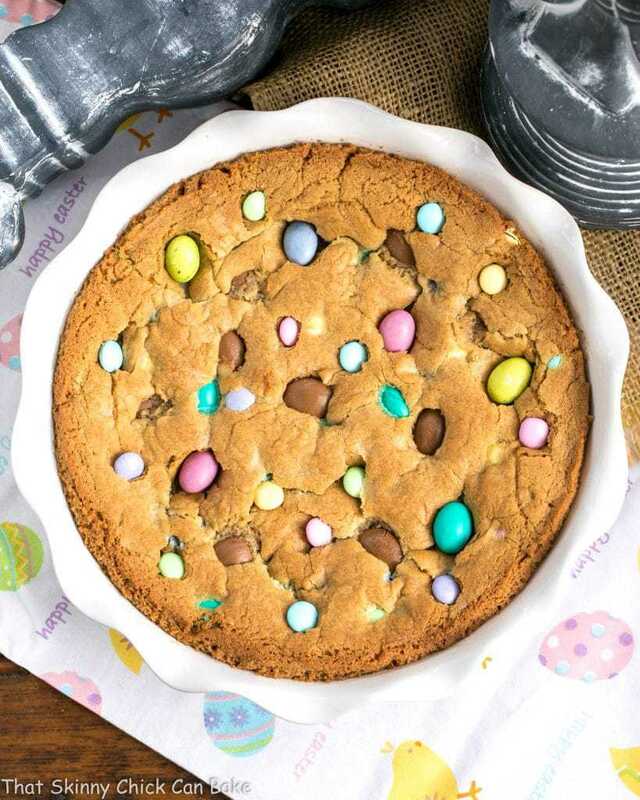 It’s time for baking and your Easter cookie cake looks absolutely delicious – mniam, mniam! Totally love it :-)! 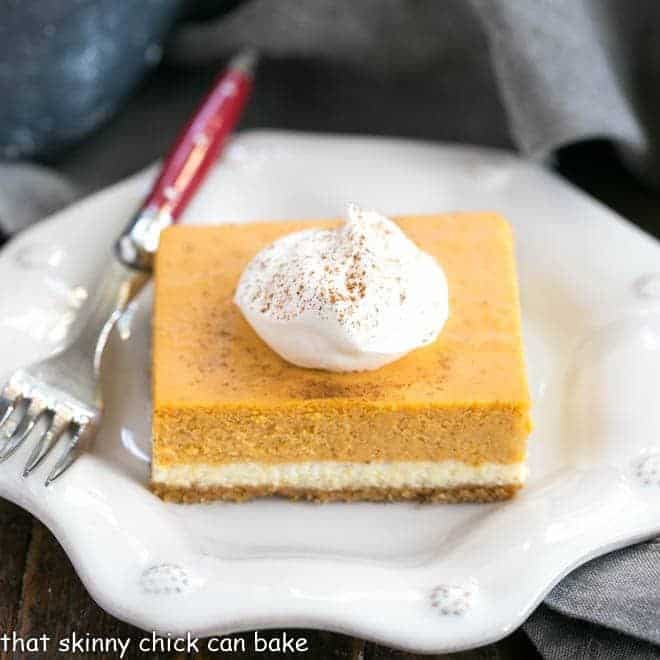 I bet it disappeared quickly at you book club meeting…it sounds hard to resist. This is so cute with the Easter candy! I love that your homemade cookie cake was the winner in the end. Who could resist a giant homemade cookie?! Dear Liz, what a pretty Easter treat – if I show your pictures to my kids, they will beg for me to bake it for them! 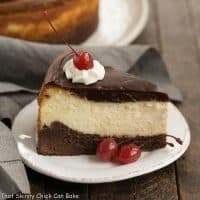 Fun, decadent and just plain wonderful! The Easter Bunny was working overtime on this idea =) Seriously, the Easter candy in the stores is alluring as is your dessert…which definitely looks better than store bought! My granddaughter and son-in-law would flip for this one! I’m also one of those bloggers who is frequently behind the holiday and seasonal calendar so you’re not alone! What a delicious looking Easter Cookie Cake, Liz! No wonder there was never another request for a store bough cookie cake. You can’t beat the ingredients but it’s the LOVE that can never be baked in to one of those store boughts! What a festive cake Liz, I just love it. Chocolatey, crunchy and chewy are all the right words to get my attention! I try to work ahead too but somehow something always gets in the way so I figure it’s for next year! Can’t wait to see what else you’ve got baking! A giant cookie that grows and grows, sounds like the beginning of a wonderful story. Gorgeous!! I’ve been wanting to make a cookie cake for such a long time….. I hope I make it soon. Made it for Easter dessert today (because I didn’t want to make the same chocolate cake I made last year which was the original plan). I can’t believe I’m saying this, but it was almost too much chocolate! Regardless, I served it slightly warm and it was a hit. Will definitely make it again….perhaps without the candy, but with a few nuts and raisins (and a few chocolate chips). Thanks for the recipe! LOL, yeah, I can see that! My family love chocolate so I rarely hear that from them 🙂 Anyway, it’s a marvelous base for all sorts of add-ins. Thanks so much for the feedback. Looking gorgeous ! It is also very appropriate in kids birthday party or any occasion. Thanks ! Twisted the ingredients a bit and it turned out just as great. 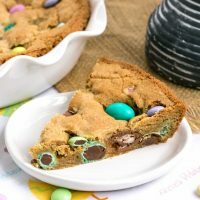 My son and I made this yesterday for Easter and we used the Easter candies in it and followed your recipe exactly (except substituted refined coconut oil for the butter) and it turned out AMAZING!! Seriously good stuff. Happy! 😀 Easter! 🐰 Thanks! Hooray! Glad you and Nick enjoyed!!! Happy Easter to you, too! 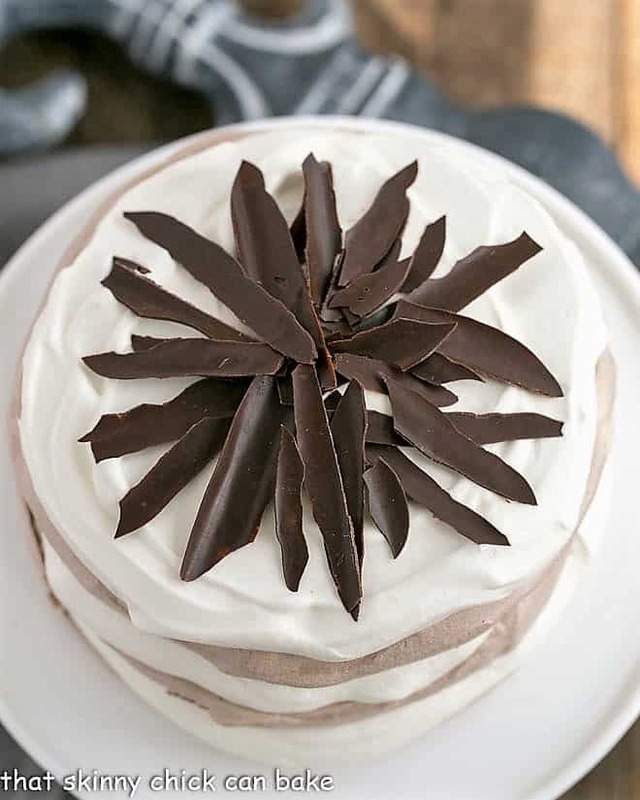 What a dreamy dessert for Easter! So much to love!! I’m sure it will disappear fast! Pingback: 16 delightful easter treat ideas - recipes, DIY and more easy ideas! Cookie cake is always a win! Can’t wait to try it. Such a fun and delicious cookie for Easter dessert. 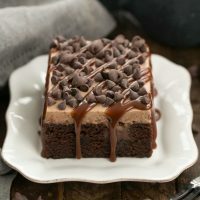 I’m going to make this with all the Easter candy lying around! Ha ha.. It is funny that he asked for a store bought cookie when he has a mom who can bake the most amazing baked goods. Ahhh kids.. 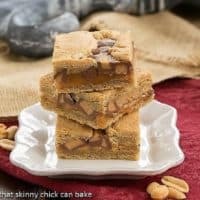 This is such a fun cookie recipe. Perfect to make it with kids as well. Thanks for sharing.